© 2018 Ismail et al. Acridine is a class of organic compounds which offers a wide range of biological and physical properties due to its unique chemical skeleton. A lot of researches have focused on the moulding of the substituents of the acridine ring system in an attempt to enhance its biological applications, especially in terms of anticancers, antioxidants, and antivirals. In this study, a new compound N-(3,5-dimethoxyphenyl)acridin-9-amine (G4) was synthesized through the Ullmann condensation of 2-chlorobenzoic acid and 3,5-dimethoxyaniline. In vitro cytotoxicity investigations of G4 on normal cell (WRL 68) and cancer cell lines (MCF-7, HT29 and HL60) were then conducted. In vivo evaluation or acute toxicology, was also carried out whereby male and female mice were administered G4 orally in single doses of 0 (control group), 500, and 1000 mg/kg. As per the results, G4 exhibited in vitro antiproliferative activity on all the cancer cell lines tested. Also, no signs of toxicity were observed in the mice even after being administered the highest dose of G4. The structure of the compound was determined by single crystal X-ray diffraction analysis, CHN elemental analysis, Fourier Transformed Infrared (FTIR), 1H nuclear magnetic resonance (NMR), and 13C attached proton test (APT) NMR. G4 was found to be slightly planar and in discrete asymmetric units. The acridine was observed to be bound to 3,5-dimethoxyaniline (N1) as the confirmed G4 molecule. 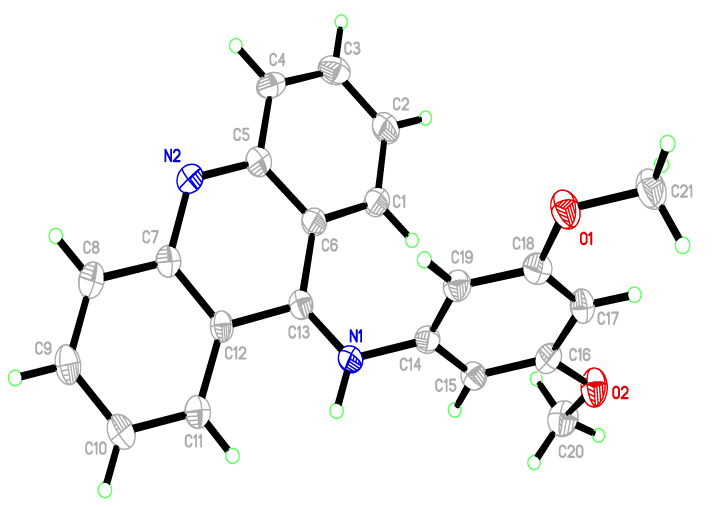 Also, the exocyclic carbon at position C13 was found to be monodentate and slightly planar. G4 exhibited profound antiproliferative activity towards HL60 cancer cell lines. Keywords: Acridine, Heterocycle, N-(3,5- Dimethoxyphenyl)acridin-9-amine, Acute toxicity, Antiproliferative, Anticancers. Acridine is a class of organic compounds known as π-electron-deficient heterocycles that possess a number of unique chemical and physical properties . It is also widely reported that acridine an N-donor ligand, has a high tendency to cyclometallate compounds, especially those of heavy metals such as platinum  and palladium . The biological activity of acridine can primarily be attributed to its core structure a benzene ring and either –NHCH2- or –NHCH2CH2- . Moreover, the other substituents that attach to acridine especially 9-anilinacridine , are proven to be able to enhance the biological potency of acridine and reduce its side effects following interaction with DNA . Hence, the modification of acridine either by metallation or by changing its substituents is an interesting field for researchers in their quest to discover new potent anticancer agents. Nowadays, cancer is one of the major diseases  which results in mortality, and its occurrence is increasing by the year. In 2012, about 14 million new cancer cases have been reported worldwide, 2.2 million (15.4%) of which were due to carcinogenic infections . In medical science, acridine is a chemical with anticancer activity  and is used as an antileukemic agent, for instance . This is in light of the interactions between its π-π system and the base pairs of double-stranded DNA, notwithstanding the high affinity of the latter for the former. Furthermore, amsacrine (m-AMSA), an acridine derivative, was the first known DNA-intercalating agent, or topoisomerase II inhibitor [6b]. Acridine also possesses a wide range of other biological activities, which include antibacterial , trypanocidal , and antimalarial  activities. Additionally, this compound has various other applications. For example, the fluorescence of acridine (AO)  allows the detection of tumors, metasteses, and residual disease after surgical excision . Meanwhile, acridine yellow is used as a dye-like biomolecule  in numerous photosensitizer studies. An example is a research on solar cell production , in which acridine yellow is involved in the synthesis of TiO2 films containing nanosized semiconductor particles. In this research, we report the anticancer activity of N-(3,5- dimethoxyphenyl)acridin-9-amine (G4), which has been studied in vitro as well as in vivo. When the methoxy functional group was added to acridine, the anticancer activity of the derivative was enhanced, thus allowing it to be further developed as a chemotherapeutic drug . The chemicals and solvents were obtained from Merck, Sigma-Aldrich, and Fisher Scientific, and were used without further purification unless stated otherwise. 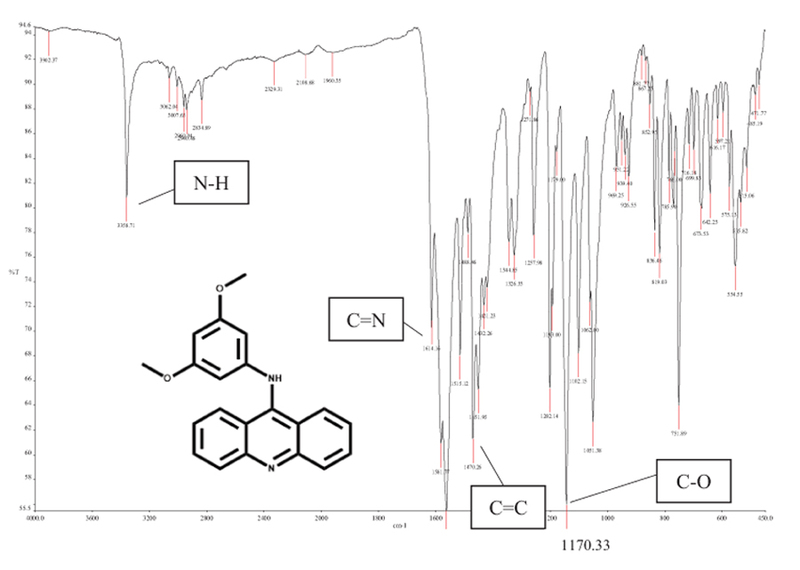 The infrared spectra of the synthesized compounds were measured using a Perkin Elmer Spectrum One FT-IR spectrophotometer (ATR) within the wavelength range of 450 – 4000 cm-1. The 1H and 13C-APT Nuclear Magnetic Resonance (NMR) spectra were determined by an AVN Bruker 400 FT-NMR and Jeol ECX DELTA 400 MHz spectroscope, with deuterated chloroform as the solvent. Elemental analysis of the carbon, hydrogen, and nitrogen (CHN) compositions were performed using a Perkin Elmer CHNS/O 2400 series II elemental analyser. The single crystal X-ray diffraction data of some of the complexes were assessed using a Bruker APEX II CCD diffractometer which employed graphite-monochromated Mo Kα radiation (λ=0.71073Å) at 100 K. The intensities were obtained via ω - 2θ scan mode in the range of 3.1° < θ < 26.0°. The structure of the compound was solved directly by the SHELXS-97 program (Sheldrick, 2008) and refined via a full matrix least-square method on F2 using the SHELXL-97 program package (semi-empirical absorption corrections were applied using SADABS program). The melting point of the compound was determined using a capillary melting point apparatus (MEL-TEMP II Laboratory Devices, USA). Three steps were involved in the synthesis of G4, whereby the two initial steps Scheme (1) were performed to obtain the cyclic compound 2 for use in the third step. In general, 2-(phenylamino)benzoic acid (1) and 9-chloroacridine (2) were prepared according to the procedure in the literature . The first step involved the Ullmann condensation reaction, whereby 2-chloro benzoic acid and aniline were dissolved in K2CO3 in dimethylformamide (DMF). The mixture was refluxed at 136oC overnight under continuous stirring, with copper iodide and copper powder as the catalysts. After compound 1 was formed, it was cyclized by refluxing at 135 – 145 °C for 3 hours with POCl3. Compound 2, a yellow precipitate, was obtained, which was then purified using concentrated ammonia and crushed ice. Scheme (2) outlines the steps of G4 synthesis using pre-synthesized compound 2. 3,5-dimethoxyaniline (0.7 g, 4.7 mmol) and potassium carbonate (0.7 g, 4.7 mmol) were dissolved in absolute ethanol (ca 20.0 ml). The mixture was stirred for 45 minutes at room temperature, after which compound 2 (0.5 g, 2.3 mmol) and potassium iodide (0.1 g, 0.6 mmol) were added. The mixture was further stirred and refluxed overnight. Upon completion of the reaction, the solvent was evaporated and the remaining solid was poured into 50.0 ml of water and extracted with ethyl acetate. The orange precipitate was filtered out and washed with cold methanol prior to drying. The physical data is listed in (Table 1). Scheme. (2). Synthesis of N-(3,5- dimethoxyphenyl)acridin-9-amine (G4). Table 1. Physical data for the N-(3,5 dimethoxyphenyl)acridin-9-amine, G4. Cell cultures were maintained in humidified air with 5% CO2 at 37°C. MTT assay is currently the most commonly-used method to test the cytotoxicity of G4. The cells were plated in triplicates on a 96-well plate at a density of 2 × 105 cells/mL in 100 μL of culture medium. Different concentrations of G4 (50, 25, 12.5, 6, 3, and 1.5 μg/mL) were prepared by serial dilution. All serial dilutions were transferred to the cells in the 96-well plates. Untreated cells acted as the control. The cells were incubated for 24 hours, after which their viability was assessed by adding 20 μL of 3-(4,5-dimethylthiazol-2-yl)-2,5-diphenyltetrazolium bromide (MTT, 5 mg/mL) to the cells in a dark room. The cells were then covered with aluminium foil and incubated for another 4 hours. Then, all the media were removed and 100 μL of DMSO added to the cells to solubilize the formazan crystals. Subsequently, the absorbance was read at a wavelength of 570 nm using a microplate reader. The test agents’ cell growth inhibition abilities were expressed in terms of IC50 (i.e. the concentrations at which cell growths were reduced by half). Mice of both genders were obtained from the Animal House Unit, Faculty of Medicine, University of Malaya (UM). All procedures on these animals were carried out in compliance with the regulations designated by the Institutional Animal Care and Use Committee, Faculty of Medicine, UM. The mice were kept in sterilized plastic cages with homogenized wood shavings as bedding. The ambient temperature was maintained at 22 ± 2°C, with 12 hours each of in the light-dark cycle and a relative humidity of 50 – 60%. Food and water were supplied at all times. All biochemical assays were performed spectrophotometrically using a Hitachi-912 Autoanalyzer (Mannheim, Germany). Kidney functions were assessed in terms of anion gaps, blood urea nitrogen, as well as serum creatinine, sodium, potassium, chloride, and carbon dioxide levels. Serum Alanine Aminotransferase (ALT), Alkaline Phosphate (ALP), Gamma-Glutamyl Transferase (GGT), albumin, globulin, and bilirubin levels were also measured to evaluate the liver functions. All the serum samples were analysed in a blind manner to obtain data with good sensitivity and validity. The concentrations of total cholesterol and High-Density Lipoprotein (HDL) cholesterol were estimated using the commercial kits by Span Diagnostics in accordance with the method described in the literature . The triglyceride concentrations were assessed by GPO-PAP end-point assay. Renal and hepatic tissues were fixed in 10% formalin and embedded in paraffin, after which they were sectioned at intervals of 5 μm and stained with hematoxylin-eosin solution. All sections were examined photomicroscopically (Olympus BH-2, Japan) by an independent histopathologist who had no knowledge of the treatment groups. All data were expressed as means ± SD and analysed using one-way ANOVA followed by post-hoc Tukey HSD multiple comparisons test. The type-1 error level was set P < 0.05 for all tests. This entire process was performed using SPSS software (Chicago, IL, USA) version 19.0 for Microsoft Windows. G4 was synthesized via one-pot reaction, which began with the reaction between 9-chloroacridine (a ligand) reacted with 3,5-dimethoxyaniline (a aniline substituent) in absolute ethanol, with potassium iodide as the catalyst. The orange precipitate of G4 was dissolved in methanol, and a few drops of triethylamine added to form solid, dark red, single crystal. This crystal was grown at room temperature. G4 was characterized by FTIR, 1H, 13C-APT NMR, and elemental analysis. The molecular and crystal structures of G4 were determined using single crystal X-ray diffraction. Fig. (1). FTIR spectrum for G4. Fig. (2). Two tautomeric forms of 9-aminoacridine. In the FTIR spectrum Fig. (1) as listed in Table 1, the absorption band at 1170.3 cm-1 was assigned to the methoxy group -OCH3. The presence of aromatic rings in the structure was proven by =C-H sp2 stretching at 3062.0 cm-1 and C=C stretching at 1470.3 cm-1. The absorbance of the -NH group was observed at 3358.7 cm-1, indicating the conversion of the -NH2 group to –NH. This was consistent with the bond formation between 9-chloroacridine and 3,5-dimethoxy aniline via -NH2 deprotonation. The 1H NMR Table 2 spectrum of G4 showed six protons as a singlet at δ 3.64 ppm in two -O-CH3 groups. The three aromatic rings in G4 were denoted as multiplets between δ 6.50 and 8.30 ppm. Within these peaks, there were two doublet peaks at δ 8.26 and 8.16 ppm (i.e. the most deshielded region) as compared to other -C-H aromatic signals. This was assigned to the four protons of acridine. Meanwhile 13C-APT NMR Table 3 revealed five and seven signals of quaternary and tertiary carbons respectively. The aromatic carbon atoms attached to the methoxy group were denoted at 161.62 ppm, while the methoxy carbon peak was at 55.61 ppm. It was reported that the skeleton of 9-aminoacridine derived from the parent acridine can exist in two tautomeric forms  – imine or amine form Fig. (2). Tautomerization can occur when different solvents or reaction temperatures are used. Nevertheless, G4 was observed to be more stable in amine form as proven by the crystal structure. The structure of G4 was determined by single crystal X-ray diffraction analysis and is found to be of discrete asymmetric units (Fig. 3). The crystal data has been deposited to Cambridge Crystallographic Data Centre (CCDC) with the deposition number of CCDC 1587404. The crystallographic data and that of its structure refinement were collected and presented in Table 4. In the G4 molecule, 9-acridine (C13) is bound to 3,5-dimethoxyaniline (N1), as expected. The bond lengths and angles (Table 5) were in agreement with those of other associated derivatives in the literature . The molecule can be divided into two main fragments: (C1-C13/N2) and (N1/C14-C21/O1/O2). The C1-C13/N2 and N1/C14-C21/O1/O2 planes were slightly planar, with a maximum deviation of C13 from the mean plane that was 0.368(2). The dihedral angle between the aforementioned planes was 63.53(6)°. Also, there were no intra- or inter-hydrogen bonds in this molecule (Fig. 4). Table 4. Crystal data and structure refinement of G4. Fig. (3). The ORTEP diagram of G4, showing 50% probability displacement ellipsoids and the atom-numbering scheme. Table 5. Selected bond length (Å) and angles (°). Fig. (4). The packing of G4 as viewed down to the b axis. The effects of G4 on the viability of MCF-7, HL60, HT29, and WRL68 cells were measured using MTT assay. Following 24 hours of exposure to G4, there was a significant inhibition of cellular proliferation in the treated cells as compared to the non-treated cells (controls). Among the tested cells, HL-60 gave the best results with an IC50 of 15 ± 0.03 Table 6. The present study has shown that the cytotoxic activities of G4 on MCF-7, HT29, and HL60 cells were high while that of WRL68 was very low. The findings suggested that G4 is a potential candidate for further anticancer studies. Table 6. Cytotoxicities of G4 in MTT assay. The acute toxicity study was carried out to determine a nontoxic dose of G4. After fourteen days of the intragastrical administration of two different concentrations of G4, no behavioural alterations or deaths were observed. In the mice, G4 did not show any abnormalities in terms of their behaviours or physical appearances. Food and water were provided as usual, and the faeces of the mice were dark and dry. There were no significant differences in the body weights of the mice as well. Table 7. Serum biochemical data for male and female mice orally administered G4 at different concentrations for 14 days. All mice that were treated with either 500 or 1000 mg/kg of G4 did not exhibit significant differences in the levels of their liver function markers (albumin, total bilirubin, ALP, ALT, and GGT). Table 7. contains the data on serum biochemistry. There were also no significant changes in the renal profiles (potassium, chloride, sodium, and urea) of the mice. For the mice dosed with 500 mg/kg of G4, there were significant increases in the total cholesterol, HDL cholesterol, LDL cholesterol, and triglyceride levels of all mice except for the triglyceride level for male mice that is slightly decreased. As for the mice treated with 1000 mg/kg of G4, in male mice, the triglyceride and total cholesterol levels were decreased while in female mice the reduced amount of LDL cholesterol level was observed. On the other hand, the HDL cholesterol level for all mice, the triglyceride level for only female mice and LDL cholesterol level for male mice were found to be increasing. Nevertheless, the total cholesterol level on female mice was unchanged as compared to the control mice. The effects of G4 on the lipid profile are shown in Table (8). Table 8. Effect of G4 on triglycerides, total cholesterol, HDL cholesterol, and LDL cholesterol. The kidney and liver examinations of mice did not show any abnormalities in terms of gross appearance and weight as a result of G4 consumption. The results of gross examination were also confirmed by histopathological assessment. There were no detected ions of any damage in their gastroinstestinal tracts or the potential and direct target for toxic effects of the ingested foods. G4 was also not responsible for any significant histological changes in the mice Fig. (5). Hence, it can be concluded that there was no necrosis, cirrhosis, and inflammation. These outcomes revealed that intragastric G4 up to a concentration of 1000 mg/kg was not toxic to mice. Fig. (5). 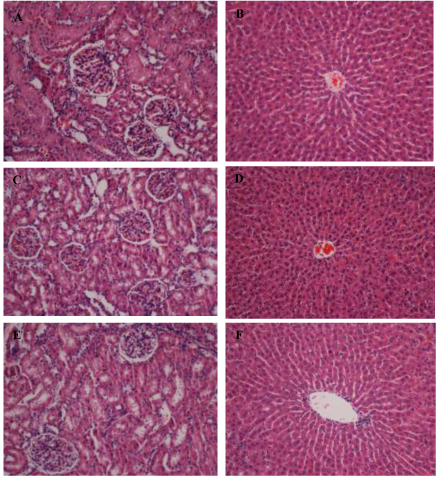 Effect of G4 on histological sections of the liver and kidney in mice. (A, B) Mice treated with vehicle. (C, D) Mice treated with 500 mg/kg of G4. (E, F) Mice treated with 1000 mg/kg of G4. There are no significant differences in the architectures of the livers and kidneys between the treatment and control groups (H & E stain, 20× magnification). The acridine was observed to be bound to 3,5-dimethoxyaniline (N1) as the confirmed G4 molecule. Also, the exocyclic carbon at position C13 was found to be monodentate and slightly planar. G4 exhibited profound antiproliferative activity towards HL60 cancer cell lines. Intragastrical administration of up to 1000 mg/kg of G4 did not result in toxicity effects to the mice. The anticancer mechanism of G4 can be further investigated in vitro and in vivo since there is evidence for its potential to be developed into new pharmaceutical drugs. This work was supported by the University of Malaya IPPP Grant; Grant No. PG107-2016A and Grant No. RACE CR011-2015. Special thanks to Dr Mohd Ridzuan Mohd Abd Razak of Institute for Medical Research (IMR), Kuala Lumpur for his help in biological evaluation write-up. (a) Korth C, May BC, Cohen FE, Prusiner SB. Acridine and phenothiazine derivatives as pharmacotherapeutics for prion disease. Proc Natl Acad Sci USA 2001; 98(17): 9836-41. (b) Kumar A, Kumar N, Roy P, Sondhi SM, Sharma A. Synthesis of acridine cyclic imide hybrid molecules and their evaluation for anticancer activity. Med Chem Res 2015; 24(8): 3272-82. (a) Temple MD, McFadyen WD, Holmes RJ, Denny WA, Murray V. Interaction of cisplatin and DNA-targeted 9-aminoacridine platinum complexes with DNA. Biochemistry 2000; 39(18): 5593-9. (b) Maresca L, Pacifico C, Pappadopoli MC, Natile G. Endocyclic versus exocyclic N-coordination to platinum(II) of some nitro-9-[(2-dialkylaminoethyl)amino]acridines. Inorg Chim Acta 2000; 304(2): 274-82. (a) Riera X, Moreno V, Ciudad CJ, Noe V, Font-Bardía M, Solans X. Complexes of Pd(II) and Pt(II) with 9-aminoacridine: Reactions with DNA and study of their antiproliferative activity. Bioinorg Chem Appl 2007; 2007: 98732. (b) Ruiz J, Lorenzo J, Vicente C, et al. New palladium(II) and platinum(II) complexes with 9-aminoacridine: structures, luminiscence, theoretical calculations, and antitumor activity. Inorg Chem 2008; 47(15): 6990-7001. Pang X, Chen C, Su X, Li M, Wen L. Diverse tandem cyclization reactions of o-cyanoanilines and diaryliodonium salts with copper catalyst for the construction of quinazolinimine and acridine scaffolds. Org Lett 2014; 16(23): 6228-31. (a) Borovlev IV, Demidov OP, Amangasieva GA, Avakyan EK. Direct and facile synthesis of 9-aminoacridine and acridin-9-yl-ureas. Tetrahedron Lett 2016; 57(32): 3608-11. (b) Sondhi SM, Kumar S, Rani R, Chakraborty A, Roy P. Synthesis of Bis-acridine Derivatives Exhibiting Anticancer and Anti-inflammatory Activity. J Heterocycl Chem 2013; 50(2): 252-60. (a) Di Giorgio C, Nikoyan A, Decome L, et al. DNA-damaging activity and mutagenicity of 16 newly synthesized thiazolo [5,4-a]acridine derivatives with high photo-inducible cytotoxicity. Mutat Res 2008; 650(2): 104-14. (b) Ketron AC, Denny WA, Graves DE, Osheroff N. Amsacrine as a topoisomerase II poison: Importance of drug-DNA interactions. Biochemistry 2012; 51(8): 1730-9. (c) Loza-Mejía MA, Castillo R, Lira-Rocha A. Molecular modeling of tricyclic compounds with anilino substituents and their intercalation complexes with DNA sequences. J Mol Graph Model 2009; 27(8): 900-7. (d) Bacherikov VA, Chang J-Y, Lin Y-W, et al. Synthesis and antitumor activity of 5-(9-acridinylamino)anisidine derivatives. Bioorg Med Chem 2005; 13(23): 6513-20. Cuzick J, Sestak I, Cawthorn S, et al. Tamoxifen for prevention of breast cancer: extended long-term follow-up of the IBIS-I breast cancer prevention trial. Lancet Oncol 2015; 16(1): 67-75. (a) de Martel C, Ferlay J, Franceschi S, et al. Global burden of cancers attributable to infections in 2008: A review and synthetic analysis. Lancet Oncol 2012; 13(6): 607-15. (b) Plummer M, de Martel C, Vignat J, Ferlay J, Bray F, Franceschi S. Global burden of cancers attributable to infections in 2012: A synthetic analysis. Lancet Glob Health 2016; 4(9): e609-16. Amit Tiwari NGK, Kumar N, Kumar N, et al. Synthesis and evaluation of selected 1,3,4 oxadiazolebderivatives for in vitro cytotoxicity and in vivo anti-tumor activity 2016; 1-13. (b) Mohammadi-Khanaposhtani M, Safavi M, Sabourian R, et al. Design, synthesis, in vitro cytotoxic activity evaluation, and apoptosis-induction study of new 9(10H)-acridinone-1,2,3-triazoles. Mol Divers 2015; 19(4): 787-95. (a) Janočková J, Plšíková J, Kašpárková J, et al. Inhibition of DNA topoisomerases I and II and growth inhibition of HL-60 cells by novel acridine-based compounds. Eur J Pharm Sci 2015; 76: 192-202. (b) Wang Y, Gao D, Chen Z, et al. Acridone derivative 8a induces oxidative stress-mediated apoptosis in CCRF-CEM leukemia cells: Application of metabolomics in mechanistic studies of antitumor agents. PLoS One 2013; 8(5): e63572. (c) Gao H, Denny WA, Garg R, Hansch C. Quantitative structure-activity relationships (QSAR) for 9-anilinoacridines: A comparative analysis. Chem Biol Interact 1998; 116(3): 157-80. (a) Wainwright M. Acridine-a neglected antibacterial chromophore. J Antimicrob Chemother 2001; 47(1): 1-13. (b) Benoit AR, Schiaffo C, Salomon CE, Goodell JR, Hiasa H, Ferguson DM. Synthesis and evaluation of N-alkyl-9-aminoacridines with antibacterial activity. Bioorg Med Chem Lett 2014; 24(14): 3014-7. Gamage SA, Figgitt DP, Wojcik SJ, et al. Structure-activity relationships for the antileishmanial and antitrypanosomal activities of 1′-substituted 9-anilinoacridines. J Med Chem 1997; 40(16): 2634-42. (a) Auparakkitanon S, Wilairat P. Cleavage of DNA induced by 9-anilinoacridine inhibitors of topoisomerase II in the malaria parasite Plasmodium falciparum. Biochem Biophys Res Commun 2000; 269(2): 406-9. (b) Prajapati SP, Kaushik NK, Zaveri M, Mohanakrishanan D, Kawathekar N, Sahal D. Synthesis, characterization and antimalarial evaluation of new β-benzoylstyrene derivatives of acridine. Arab J Chem 2012. (a) Rubio-Pons Ò, Serrano-Andrés L, Merchán M. A theoretical insight into the photophysics of acridine. J Phys Chem A 2001; 105(42): 9664-73. (b) Dai Y, Xu K, Li Q, Wang C, Liu X, Wang P. Acridine-based complex as amino acid anion fluorescent sensor in aqueous solution. Spectrochim Acta A Mol Biomol Spectrosc 2016; 157: 1-5. (c) Zhang Y, Pan J, Zhang G, Zhou X. Intercalation of herbicide propyzamide into DNA using acridine orange as a fluorescence probe. Sens Actuators B Chem 2015; 206: 630-9. Mondek J, Mravec F, Halasová T, Hnyluchová Z, Pekař M. Formation and dissociation of the acridine orange dimer as a tool for studying polyelectrolyte-surfactant interactions. Langmuir 2014; 30(29): 8726-34. (a) Mukherjee N, Podder S, Banerjee S, Majumdar S, Nandi D, Chakravarty AR. Targeted photocytotoxicity by copper(II) complexes having vitamin B6 and photoactive acridine moieties. Eur J Med Chem 2016; 122: 497-509. (b) Fahrenholtz CD, Ding S, Bernish BW, et al. Design and cellular studies of a carbon nanotube-based delivery system for a hybrid platinum-acridine anticancer agent. J Inorg Biochem 2016; 165: 170-80. Liu Y, Aghdassi N, Wang Q, Duhm S, Zhou Y, Song B. Solvent-resistant ITO work function tuning by an acridine derivative enables high performance inverted polymer solar cells. Org Electron 2016; 35: 6-11. Kostrhunova H, Malina J, Pickard AJ, et al. Replacement of a thiourea with an amidine group in a monofunctional platinum-acridine antitumor agent. Effect on DNA interactions, DNA adduct recognition and repair. Mol Pharm 2011; 8(5): 1941-54. (a) Lang X, Li L, Chen Y, et al. Novel synthetic acridine derivatives as potent DNA-binding and apoptosis-inducing antitumor agents. Bioorg Med Chem 2013; 21(14): 4170-7. (b) Li B, Gao C-M, Sun Q-S, et al. Novel synthetic acridine-based derivatives as topoisomerase I inhibitors. Chin Chem Lett 2014; 25(7): 1021-4. (a) Ibrahim MY, Abdul AB, Ibrahim TAT, Abdelwahab SI, Elhassan MM, Syam MM. Evaluation of acute toxicity and the effect of single injected doses of zerumbone on the kidney and liver functions in Sprague Dawley rats. Afr J Biotechnol 2010; 9(28): 4442-50. (b) Ibrahim MY, Hashim NM, Mohan S, et al. α-Mangostin from Cratoxylum arborescens: an in vitro and in vivo toxicological evaluation. Arab J Chem 2015; 8(1): 129-37. Wybenga DR, Pileggi VJ, Dirstine PH, Di Giorgio J. Direct manual determination of serum total cholesterol with a single stable reagent. Clin Chem 1970; 16(12): 980-4. Lowry OH, Rosebrough NJ, Farr AL, Randall RJ. Protein measurement with the Folin phenol reagent. J Biol Chem 1951; 193(1): 265-75. Ellman GL. Tissue sulfhydryl groups. Arch Biochem Biophys 1959; 82(1): 70-7. Carlone M, Di Masi NG, Maresca L, Margiotta N, Natile G. Role of metal ions and hydrogen bond acceptors in the tautomeric equilibrium of nitro-9 [(alkylamino)amino]-acridine drugs. Bioinorg Chem Appl 2004; 2(1-2): 93-104. (a) Jimenez MB, Gonzalez FS, Caballero MC. 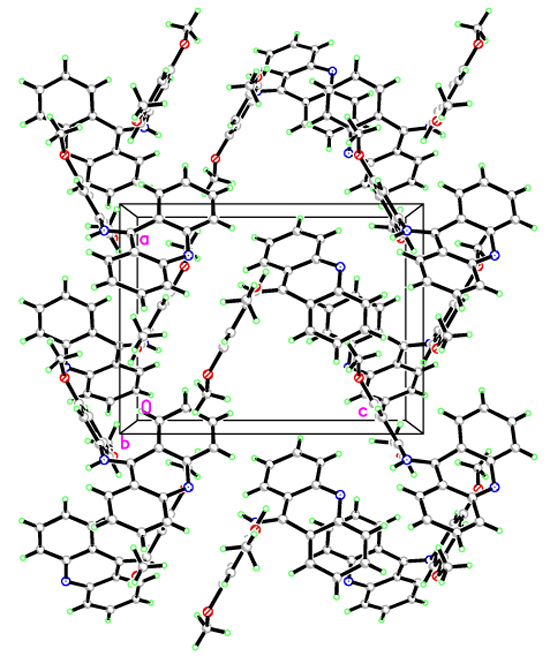 Crystal structure of dimethyl 5-(acridin-9-yloxy) isophthalate-methanol (1: 1), C23H17NO5· CH3OH. Z Kristallogr, New Cryst Struct 2009; 224(4): 603-4. (b) Solovyeva EV, Starova GL, Myund LA, Denisova AS. X-ray, IR and Raman study of Ag (I), Cu (II) and Cd (II) complexes with 4, 5-bis (N, N-di (2-hydroxyethyl) iminomethyl) acridine. Polyhedron 2016; 106: 1-9.